360° Product Viewer for Shopify - Magic 360. Top Rated Shopify App! A supreme 360 spin for Shopify. Top retailers named 360 photography as their most important user-experience improvement. Upload 3D model of your product and you are done. Use photos captured from a turntable or 3D CAD model images. Want to instill customer confidence, save time answering questions & reduce returns? Try Magic 360! This 360 product viewer app provides customers with the ultimate shopping experience. Thanks to its 360 degree spin, customers view products from every angle. The magnify option shows the smallest of details & the full-screen spin looks gorgeous (especially on handheld devices). The 360 rotation is created using a set of images. Each image moves ever so slightly which when combined on the product page creates the 360 spin effect. Magic 360 is a Shopify app like no other. For a one-off payment (no monthly costs), the 360 viewer offers you flexibility for your product pages. Display the 360 spin on its own; or combine the 360 viewer with static images. It's your choice. Ready to add the WOW factor to your online store? Get the 360 viewer app today (free trial) from the Shopify store! Read reviews of Magic 360 on the official marketplace for Shopify apps. Install Magic 360 app directly from Shopify App Store! Go to Magic 360 on the Shopify store to install this Shopify 360 spin app (free and fully functional demo version). Click 'Install' to install Magic 360 on your store. Go to your Magic 360 app settings page: Dashboard > Apps > Magic 360 > View details > Edit preferences. Specify how many photos make up your spin (the default is 36). Every product which has that number of images will automatically have the Magic 360 effect applied to it. 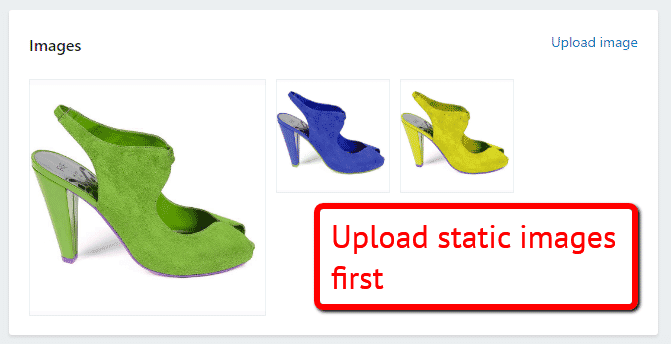 Upload your set of 360° photos to your product page using the standard Shopify image uploader. Customize Magic 360 however you wish (speed, autospin, text etc.). Go to: Dashboard > Apps > Magic 360 > View details > Edit preferences. 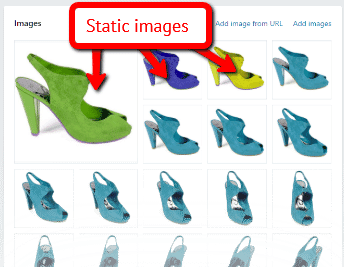 To display static images and a 360 spin on the same product page, upload static images first to your product. Then upload your set of 360 images. To upgrade your version of Magic 360 (which removes the "Trial version" text), buy Magic 360 from our website or the Shopify site. Magic 360 is free to try for 30 days. There are two ways to pay for a full license. 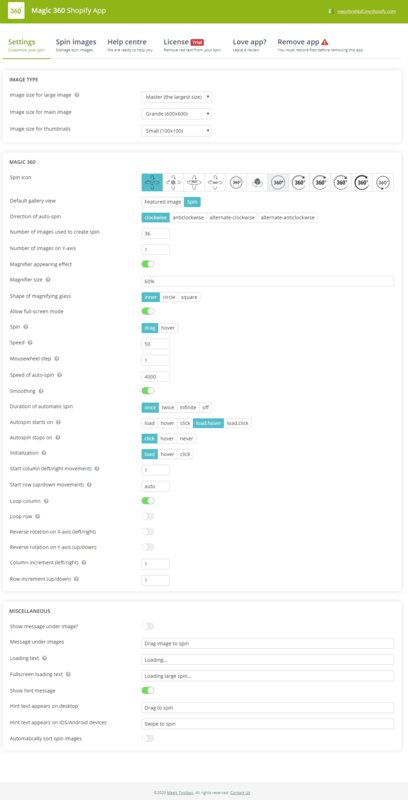 Go to your Shopify Magic 360 settings page (Dashboard > Apps > Magic 360 > View details > Edit preferences) and click the Buy now button. Click the Buy Magic 360 button and follow the payment process. Learn how to spin products 360 degrees on your Shopify store! Do you have additional images of your product? Want to show static images and a 360 degree spin on the same product page? Upload static images to your product first. Then upload your set of 360 images. The 360 spin and additional static images will display as thumbnails under the main product image. To spin some images & zoom others on the same product page can be easily achieved thanks to our 360 spin service Sirv & our Shopify app Magic Zoom Plus. Get ready to blow your customers minds. 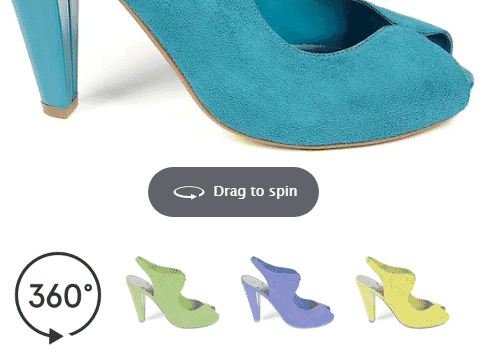 Enjoy 3D spins on your Shopify product pages for up/down & left/right movement. Check out how to name your images to create this awesome effect. Go to your product & upload set of 360 spin images. Click the HTML icon in the product description area. Enter the following <script> code in the description area. Thanks for trying Magic 360 on your Shopify site! What did you hope Magic 360 could do? How can we improve it? Let us know, we're always improving our tools based on customer feedback. The Magic 360 app creates backups of theme.liquid and product.liquid files during installation. 'Restoring files' replaces actual versions of templates with previously made backups. If you're worried you don't have backups of your original theme.liquid and product.liquid files, please create a staff account for support@magictoolbox.com and we will help you. You can create a staff account via: Admin > Settings > Account > Add a staff member. Go to: Dashboard > Apps > Magic 360 > View details > Edit preferences > (you are now on the Settings page) > Click 'Remove app' tab > Click 'Restore files' button. Can I disable Magic 360 on specific Shopify products? Yes! Enter no360 in the 'Tags' field of the Shopify product you do not want your images to show as a 360 spin. By adding a tag of no360 to a product, Magic 360 functionality will not apply to that product. No problem! If you have a spin which was created using a different number of images than the default number which appears in the 'Number of images on X-Axis' option on the Magic 360 app settings page, simply add a tag of spinimages=N to the product (where N is the number of spin images). One of the great support they are providing. app works great. We had one small issue where this app was interfering with another and the Magic 360 support team solved it overnight with no work required on our end. Highly recommend! Personal support, can help with everything! Instant help received, very happy with the service. Reliable and super fast. Paula is so great and super helpful! Great app and service! The customer support is very helpful and very fast compare to other apps in Shopify that I've tried. Plus, I prefer the user friendliness of the Magic 360. 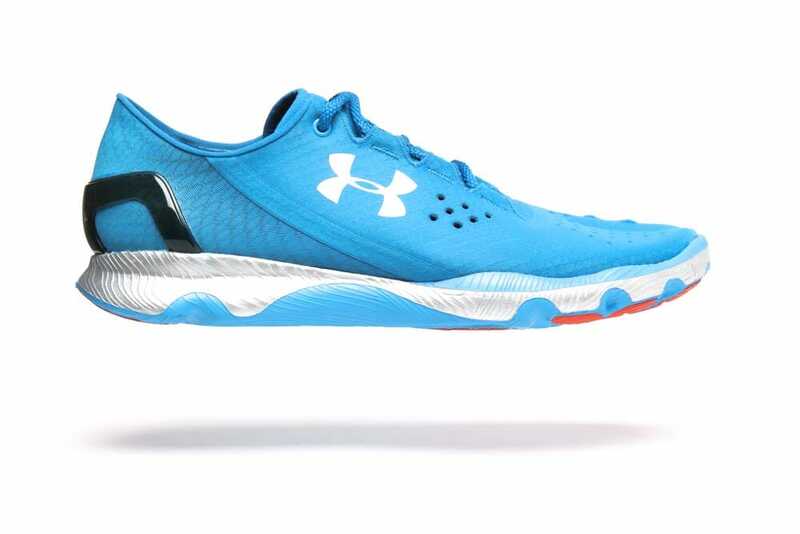 When you photograph your spins, Magic 360 supports spins in 360 spin (one row), 3D spin (multiple rows) or with the Martini effect (one horizontal row, one vertical column) like the blue running shoe above.